There's really no way an American can avoid the knowledge that this weekend is Superbowl weekend. Every news source in the USA is spewing predictions about Tom Brady's ankle and the Giants underdog status. At the same time, many of us are planning their food list for Superbowl Sunday. I, too, am among this crowd. Unlike last weekend, this coming weekend is relatively un-planned. 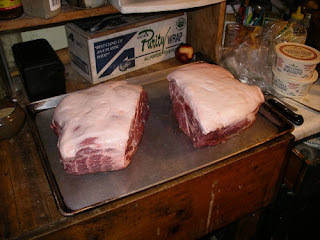 In my freezer are the two briskets and two pork shoulders I bought a couple of weeks ago. On Saturday AM, I'm planning on cooking them up, although they're to be used at a later date. I've been batting around ideas for a meal theme with Mr. Muleskinner. We've decided that we like the idea of a meal made of mostly appetizers. Atomic Buffalo Turds (commonly known as ABT's). As crude as the name is, this is a rockin' finger food. ABT's consist of Jalapeños stuffed with goat cheese (and possibly pulled pork), wrapped in bacon and smoked. Smoked Chipoltle Deviled Eggs. While I'm cooking the big meats, I'll throw a dozen or so eggs on the top shelf and smoke them. Once they're cooked through, we'll make them into deviled eggs. Instead of mustard and mayo though, I mix in chipotle peppers and hot sauce with may and pipe that into the halved eggs. Something else. I'm not sure what else I want to do. Marinated steak tips come to mind. Or perhaps some sort of shrimpy thing for those who eat shrimp. In addition, I'll likely have some smoked almonds added to the mix. This will be a fun weekend. I have to work much of Saturday, but I can do it from home and will be able to tend my pit while doing work. I intend to pay far better attention to what I'm doing than I did last weekend! After all that cooking and eating, I understand that there'll be a football game. My team of choice, the New York Jets, had no chance of seeing a superbowl this season. And my adopted NFC team, the Packers were bumped out by the Giants. So, my choice at this point is clear. I'm rooting for history to be made. This past weekend was most definitely not about food. I DID actually cook food. But I didn't really put my heart into it, and it showed. I cooked up a Jambalaya on Saturday that ended up being kind of mushy because I put the rice in to early. And, I had to mix tomato paste in at the last minute because I had forgotten to put it in. On Sunday, I fried up some boneless pork chops, but put them on too early so they were really dry and I put too much rice in my side dish making it bland. Obviously, I was focused on other things. We had a good friend over for gaming on Saturday and as the gamemaster I had other things to think about beyond food. And on Sunday we had to rush out of the house just after dinner because we had tickets to see the young English blues band "Back Door Slam". They were fantastic, by the way. If you dig blues, go buy their CD. I'm a good guitar player. If I actually practiced, I could probably be as good as their guitarist Danny Knowles. The thing is though, I'm 37. He's 20. At the same age he is now, I was still just fumbling around on the guitar. This kid has the makings of a guitar hero. But, that's not the point of this post. My two mediocre dinners served as a good reminder that no matter how good at cooking I think I am, I still need to pay attention to what I'm doing. It was a great reminder that you really DO get out what you put in. 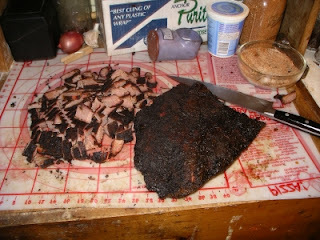 This weekend was a busy one, in fact, I wound up being too busy to take the time for cooking brisket and pork shoulder. The four big hunks of meat are now waiting for me to pull them from the freezer at a later date. The tempo of the weekend did not interfere with my prep for Muleskinner's conference championship party. Five racks of ribs spent about five hours in my pit before we left home. Between the two games I pulled them out of the hot box and finished them on his Weber, getting a nice, finished glaze on them. They were very well received. I just adore getting together with friends. I have, entirely by accident, surrounded myself with other foodees. In addition to Muleskinner and his lovely wife Ms. T, we were joined by other friends and the Duxbury half of Howling Hog Barbecue, so the food was copious and top notch. Muleskinner smoked a chicken and let it sit in Big Bob Gibson's white sauce for 11 hours prior to eating. 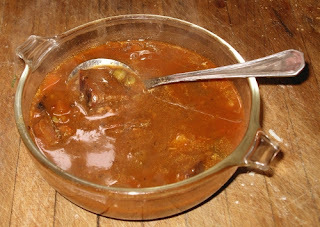 The Mamer brought down a hearty spicy chili. There were salads and sandwiches and desserts! Oh My! It was a great feast. Plus, there were a couple of football games on, too. I was rooting for old man Farve and the storied Packers, but the Giants played a solid game. Only Chargers fans were kidding themselves if they thought New England was going to lose that game. Being a Jets fan, I had no team to root for, so I was planning on taking the Pack in the event that they made it past the Giants. Now, though, my choice is clear. I'm rooting for the Pats to make some football history. 19-0 would be pretty darned impressive. After that, it's time for someone else (like the Jets, for example) to have a chance! 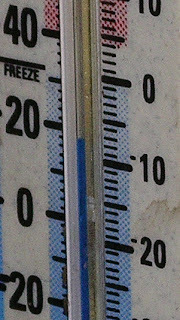 This coming weekend looks to be without any barbecuing. We've got company coming on Saturday and we're going to see "Back Door Slam" in concert on Sunday night. I think I'll do the big meats the weekend of the Superbowl. Until then - keep on smoking. 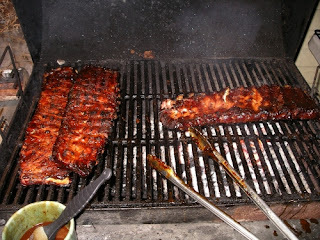 This coming weekend I'll be barbecuing again! This particular cook has been on my calendar for a while, because I'm bringing ribs to Muleskinner's NFL Conference Championship party. The best football games of the year have been the focus of this annual party for a number of years now, and it brings out some positively fantastic food. In addition to the ribs, I realized last night that I'm (gasp!) out of pulled pork. So, I put in a call to a local store near where I work and have two Boston butts en route to me for pick up on Friday. Late Saturday afternoon or evening, I'll spark up the pit and begin the long process of cooking my butts. 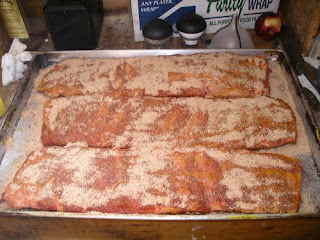 The ribs will join the butts in the morning on Sunday and will be ready and raring for the party that afternoon! Expect a post about my continuing adventures some time next week. Until then, keep smoking! 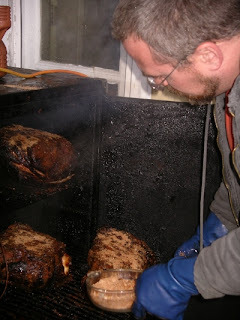 In celebration of 2007, here's a photo album of our barbecue experiences from last season. Enjoy! As always, Christmas in the Howlin' Hog Barbecue household was a generous event. We are truly blessed by our families and their generosity. In particular, I am blessed by their continued support of my barbecue habit! 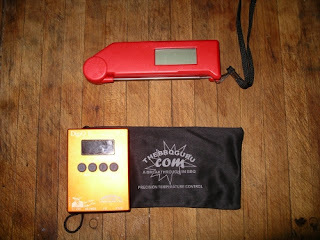 The two biggest gifts I got, which came from Farmer Girl and my Mom, were the new Barbecue Guru Digi Q II (a direct vent controller for my pit) and a Thermapen. What great new toys! I used the thermapen a bunch of times this weekend and finally felt like I had a tool that would allow me to consistently make a good steak. 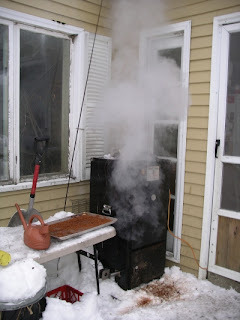 For New Year's Eve, I cooked up chicken and ribs, this time using the Digi Q II (it didn't arrive before Christmas) to run the pit. 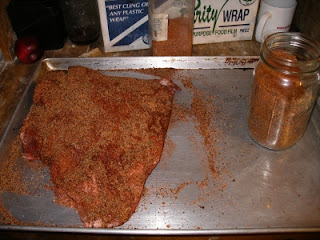 But, the two big toys pictured above weren't the only things that will help me fuel my passion for barbecue. My father got a lift jack that I can put on our homemade trailer making it easier to move around and lock in place. 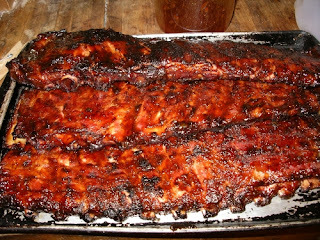 Grampy and his lady were both kind enough to donate funds to my barbecue account. This donation will no doubt help me buy more meat in the coming weeks. And Farmer Girl's mother bought a Seal-A-Meal, not knowing that I had recently purchased the Cabela's vacuum sealer. She was a bit dissapointed, but I realized as I looked at the package that having a smaller, more portable vacuum sealer on site at a barbecue competition will be really handy. So, the unit got put into storage for the upcoming season. And lastly, the wife, myself and son all have 0 degree sleeping bags to keep us cozy and warm as we cook through the night. I am grateful to have such a wonderful group of family and friends. Thank you all for your generosity. My wife and I are trying to make a concerted effort to "buy local" this holiday. Most of the gifts we handed out were either purchased locally or made buy us. As my part in our campaign to keep things either personal or local, I did a whole lot of cooking over the 22nd and 23rd. I spent two days with the BWS chugging away. 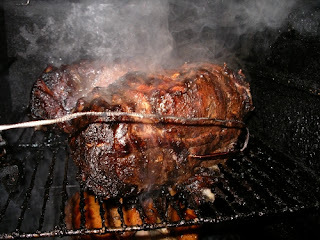 I cooked six pork shoulders, eight briskets and a couple of batches of smoked almonds. In addition, I whipped up batches of a bunch of my spice rubs and sauces. Saturday was brisket day. 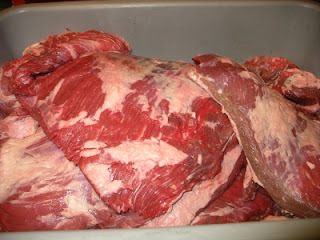 The night before, I trimmed the briskets from whole packers to flats which I prefer to cook. I kept as much of the points as possible because they make such great burnt ends. 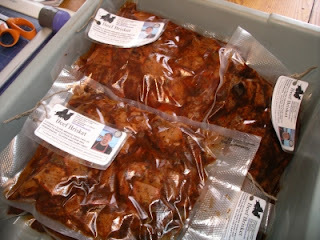 Using my Cabela's vacuum sealer I packaged up the meaty goodness for friends and family. Dig the cool labels my wife made!